A brass manifold tee that connects to various CGA storage valves and allows the connection of CGA pigtails or nut and tailpiece to each side. For air to 5500 psi. Choose your CGA: 320, 326, 346, 347, 350, 510, 540, 555, 580, 680. 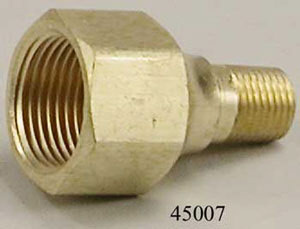 Global Air Products, 45075, brass manifold tee that connects to a CGA 347 storage valve and allows the connection of a CGA347 pigtail or nut and tailpiece to each side. For air to 5500 psi.